The European Commission is working on a strategy to reduce energy wasted in heating homes and offices, prompting concern among utilities which fear it will reduce their power sales. Early next year, the Commission plans to formulate recommendations on heating and cooling with a view to update EU energy legislation and possibly draft new directives. In five “issue papers”, seen by Reuters, the Commission presents options for a heating and cooling policy more focused on renewable energy and district heating systems that bring hot water into homes via underground pipelines. The papers state that the use of renewables in heating should be boosted with tax measures, public procurement and public investment to stimulate the development of markets. “We are convinced that in Europe we can do much better than today, when we are spending almost 40% of our energy on heating and cooling,” EU energy chief Maroš Šef?ovi? said on Thursday (8 October). Big power utilities such as EDF, E.ON and Enel, already struggling with the switch to renewable energy, fear that more renewables in heating and a switch to collective heating will further reduce power demand. Choices between gas or electricity, between better insulation or more efficient heaters, and between collective or individual heat production could have a major impact on the business models of EU energy firms. Heating and, to a lesser degree, cooling account for around 40% of European Union energy consumption, but are only indirectly targeted by existing EU policies, which focus more on power production with renewable energy. Renewable energy already accounts for 26% of electricity production in the EU but just 16.4% of heating and cooling. 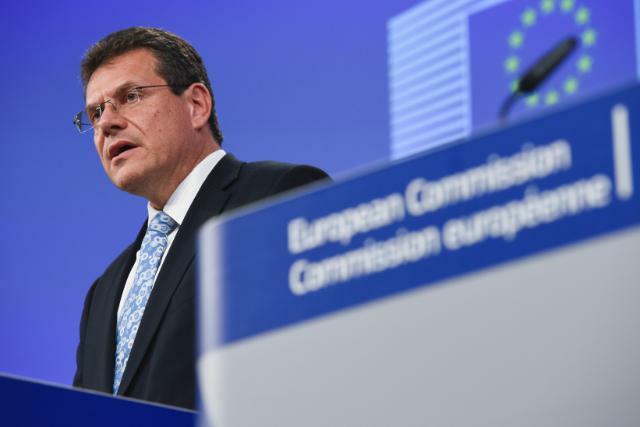 Sefcovic said the Commission will probably publish its heating and cooling strategy in February. The Commission estimates that half of Europe’s heat demand is in areas where population density is high enough for district heating infrastructure, which would be more efficient than alternatives and could cover 40% to 70% of EU heat demand. In less dense areas, electric heat pumps – which upgrade heat from air or ground water – and other new technologies offer the most energy savings for individual houses. The papers also highlights the efficiency of “Combined Heat and Power” (CHP), or cogeneration, which produces heat and electricity in the same plant and is widespread in Scandinavia. A switch to district heating would be a huge change for most of western Europe, where households mainly rely on individual gas-fired boilers for space heating and hot water. In coming weeks, trade groups and country representatives will lobby the Commission to try to steer the drafting of the communication, which will be a first step towards integrating heating and cooling into EU energy legislation. District heating systems are often run by local authorities and use gas- or biomass-fired cogeneration plants that produce both heat and power close to residential areas, reducing the need for central power production and heavy power grids. “Eurelectric recognises an emphasis on district heating in the issue papers,” the Brussels-based utilities lobby said in a note, adding that the large-scale investment in district heating would lock in technology for decades and financing is unsure. Eurelectric also disagrees with limiting the use of heat pumps to rural areas and is against mandatory cogeneration. Instead, big utilities are calling for the electrification of heating via centrally produced renewable energies and nuclear. For the hundreds of municipally owned utilities that operate local heating and power networks in Europe, this makes no sense, as it would put more stress on the continent’s power grids. “Large-scale electrification of heating and cooling seems neither feasible nor economic or ecologic,” said European Federation of Local Energy Companies (CEDEC) head Gert De Block.